46 W, Winery close, Bocce! Perfect for 1 or 2 couples, Family & Dog Friendly! Westside location, 2 Bedrooms with all the amenities of home! We would love to have you as our guests in our beautiful and relaxing vacation rental. Come stay at our 900 sq ft 2 bedroom, fully stocked home. We will also honor pricing as a 1 bedroom for 2 people only. We are located minutes from the award-winning Paso Robles wineries. As wine-enthusiasts ourselves, we can help plan your weekend with the best wineries, restaurants and things-to-do! Or, just relax, throw some meat on the BBQ, and play bocce ball or horseshoes at the court next to your home. Very desirable Westside location. Minutes to wineries and 101 freeway. Our dream was to move to Paso Robles from Orange County to raise our children and enjoy the fresh air, lots of space and the countless things to do in the Central Coast! We love this area for the wineries, the restaurants, and the amazing people of the Central Coast. We cannot wait to share our dream with you! Our home is located minutes (almost walking distance), from some of the best wineries in Paso Robles. We have beautiful views of a rural setting, and we are only 3 minutes off the 101 freeway. We are ~5 minutes from downtown Paso Robles, ~20 from Cambria (the coast) and ~25 minutes from San Luis Obispo. We have a beautiful property for you to explore, including a bocce ball court and horseshoes for your gaming pleasure! Our home is full of unique touches, including a fully stocked kitchen (no joke, you could make thankgiving dinner in this place!). Chefs will love it. Our relaxing outdoor space allows you to sit and enjoy a glass of vino, overlooking the hills of Paso Robles! The entrance to the bathroom is through the master bedroom. Truly loved our stay! 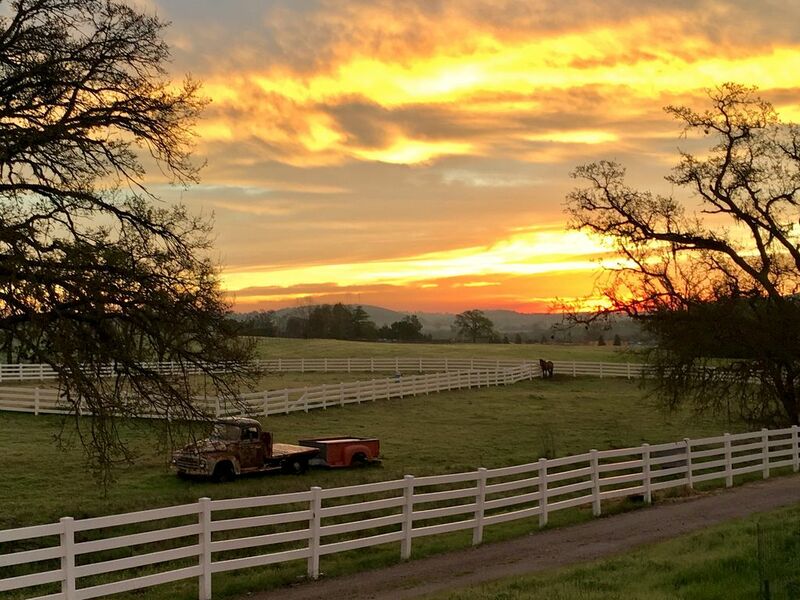 Between the stunning location, the amazing family who owns the place and the proximity to just about everything you could want in Paso, it's the perfect little retreat. Our kids and dogs loved running around the property and watching the chickens and playing on the playground. It was such a pleasure and we feel so fortunate to have had the opportunity to stay here! Cozy and comfortable cottage on 5 acres of pastoral beauty. As soon as we arrived we felt at ease. Our pups were able to safely roam around the property and we were able to soak up the sun on the patio. Close to all wineries yet private and away from the buzz. The hosts Kristin and Eric are wonderful, nice, and interesting, the kind of people you want to befriend. Unforgettable sunrises too! A true oasis in the Paso wine region. What more to say.....wifey and I looked forward to the end of daily wine tasting and touring the area to kick back and relax in style at this peaceful and serene setting in a beautiful and idyllic neighborhood. Everything we needed was provided and the hosts were most gracious. Great hosts, fabulous views, clean and cozy accommodations . Simply the best stay ever. Came down as a getaway weekend for my wife’s birthday. Found this place on VRBO and thought what a great location. Booked and came down. Oh my ! Couldn’t have been more pleased. Thank you to our hosts for allowing us to enjoy a peaceful setting, with a full. Kitchen, modern appliances, everything to make our stay one to remember. We had a wonderful time at the Farm and sincerely enjoyed the hospitality of our hosts. The cottage is modern and very comfortable. It's situated facing the rising sun so each morning was amazing. We were greeted each day by the local chickens who also provided us with fresh eggs! The Farm is very close to several wineries and the 101. We would love to stay here again.